Back from an incredible 2-month journey through Japan, where I went in search of tenkara. The experiences I had were nothing short of “tenkara”, as in “from heaven”. It’s as though some mystical forces conspired to put me in touch with a lot of what makes up tenkara tradition in Japan. There was a lot more happening than I could keep up on the blog, though I tried to write about most highlights. If you’re new to the site, please browse past blog posts, which will contain most amount of information on tenkara anywhere. If you’ve followed some of the stories I posted while in Japan, thank you so much for your comments and for checking in. My grandfather has always said, “knowledge is the only thing no one can take from you”. The things I learned in Japan will stay with me and I will continue writing about them as inspiration hits. There is a lot more I want to share with those interested in tenkara. In the meantime, as I recover from jet lag and catch up on all the email I postponed to today, I’ll leave you with a few last images from Japan. 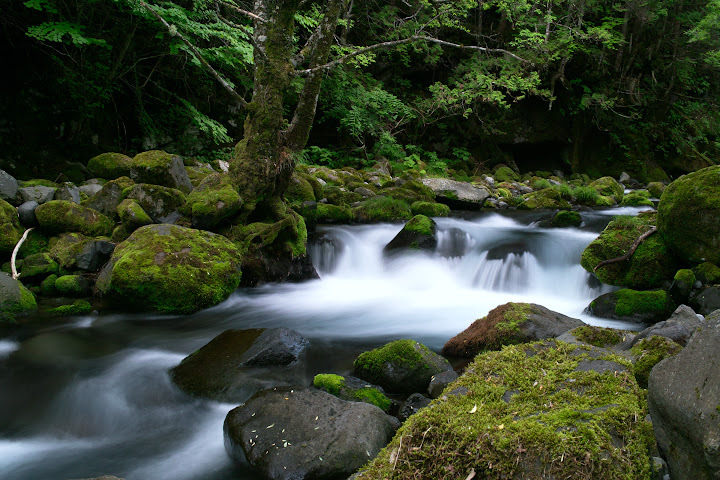 A stream I fished in Kaida-Kogen, Nagano prefecture. It had beautiful Yamato Iwana. An afternoon with Shakuhachi master. I wanted to record some music in Japan for possibly using in future videos. There was a famous shakuhachi (traditional Japanese flute) master near where I was. His house is also famous in the area as it used to belong to some samurai, and the wooden beams actually have some gnarly, sharp and deep cuts on them created during sword fights. As we toured the house I kept picturing the fights taking place a hundred years ago. It’s the only house of its kind in the area. We had a private audience with him and a couple of friends. It was quite incredible to see the energy put on playing the flute. I also tried doing it and couldn’t get a note out of the instrument, though I do admit I have always been musically challenged. Glad you are safely home and I hope the trip never leaves you. Thanks for a GREAT vicarious trip! I’ve enjoyed every minute.